Present: Charles Akben-Marchand, Eric Darwin, Archie Campbell, Ida Henderson, Ann Cavlovic, Emilie Hayes, Fauza Mohamed, Jessica Scallen, Laura Bergen, Rachel Pereira, Phil Robinson, David Seaborn, Grace Xin. 1. Minutes of July Meeting: accepted with two minor corrections, moved by Archie and seconded by Ann. 2. Guest Speaker: Emilie Hayes spoke of the Community Development Framework. The process provides a community animator/facilitator and a process for identifying needs in a particular smaller community area. The first focus is on the Rochester Heights housing complex (Gladstone and Booth) and next year may expand to the City Living housing along Albert Street. David Seaborn volunteered to attend their bi-monthly steering committee. Fauza Mohamed spoke of the Rochester Heights community house, a single townhouse that has been converted to a small community centre for the immediate neighborhood. It offers various programs and a place to meet for residents of the Heights. 3. There will be a free Get Energy Smart seminar on Wed. Sept 16 at Montgomery Legion, 330 Kent St, from 7-9pm, offering tips on low cost ways to save on energy bills. 5. The DCA has agreed to help the Festival by manning the bike check from 10.30 to 5.30 on Sat and Sunday. Volunteers get a free lunch and tshirt. We will use our presence at the bike check and Festival to promote our web site and internet information service. Anyone who can spend an hour or two at the bike check, please contact Eric by email (EricDarwin1@gmail.com). 6. Grace informed the DCA that the Gateway is almost fully funded now and construction will be completed in 2010. A fundraising dinner for the Gateway is scheduled for Oct 1. A photoshop illustration of the arch is shown above. She also noted that the parking lot owners at Somerset and Booth have applied for a license. 7. 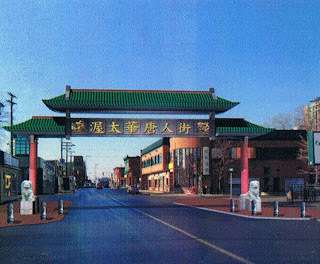 Development Committee: The Association was concerned that the Chinese church on Eccles/Lebreton has purchased two adjacent houses, for expansion. The DCA opposes the erosion of housing within the neighborhood. 8. Fall Clean Up: the Spring Clean Up was well attended and successful. Craig suggested the Fall cleanup be held on Oct 3rd but this conflicts with the Festival Asia. Craig might want to consider the week before, to prepare the neighborhood for increased visitors, or the week after. 9. Other news/updates: The DCA and neighbours objected to an infill housing project on Pamilla as too large and insensitive to the neighborhood. The Committee of Adjustment agreed and turned down the proposal. The applicant is revising the plan and appealing to the OMB. The OMB requires (expensive, hired ) expert witnesses so the DCA is unlikely to be involved. The DCA opposes the conversion of the second floor of the new Lindenhoff restaurant on Preston from residential to restaurant uses. There seems to be confusion as to the exact zoning of the upstairs, Councillor Holmes’s office will confirm the upstairs zoning. During the summer, several members of the DCA participated in a focus group on a supervised injection site in the neighborhood. The issue was covered by the media and member blogs. The proposed 15 and 13 storey office towers at 853 Carling has given renewed emphasis on restarting the Bayview-Carling Community Development Plan (CDP) which this association has been advocating. Councilor Leadman of Kitchissippi Ward is now on-board getting the CDP going again. Lori Mellor of the Preston BIA was not present to discuss their year-round farmers market proposal. DCA members are enthused about the potential to buy fresh fruit, vegetables, and food products. Eric has made contact with the condo board at 200 Lett Street (Lebreton Flats) and intends to contact other condo associations within our association area. The DCA agreed to submit a letter to council expressing our lack of comfort with the Lansdowne process (Charles to draft letter, Eric to sign and send on behalf of the DCA). Eric informed the meeting that the DCA has been accepted on the public advisory group for the new Scott Street CDP (Bayview to Westboro Station). 10. Rachel Pereira spoke on the issue of property standards. Members agreed it is time to inject some new life in a property standards and public safety committee. Eric will join the group, ask Sean Darcy to join, contact Pam Connelly, etc. 11. Laura Bergen from the councillor’s office briefed the DCA on the reconstruction of Bronson, In November, the planning starts and construction will take place in 2011-2012 from Albert to the Canal. 12. Eric is willing to set up a static DCA website with basic info on the association, and start a communication blog to convey what the DCA is doing, in an attempt to increase our relevance and improve communication to a larger group of residents. After a brief discussion, the name OttawaDalhousie.CA was favoured.